Discover over 400 years of maritime history at this great family friendly attraction. Make your own rope visit the maritime museum of the Royal dockyard and Lifeboats, hear stories of of life onboard the Historic warships. The Chatham dockyard is one of the oldest and most historic in the country, probably the most complete dockyard of the age of sail. Every day at 10.00am from 13th February to 31st October 2010. 4pm until 27th March; 6pm 28th March to 23rd October; 4pm 24th October onwards. Galleries close from 45mins prior to site closing time. 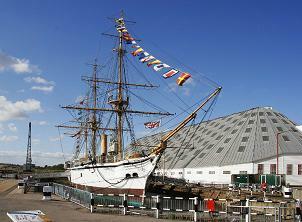 Have you been to the Chatham Dockyards, Would you recommend it?